In Vista and Windows 7, when you activate your copy of Windows by entering a product key, Windows saves the product key deep in the Registry. Since there are many applications available to retrieve windows product key from Registry, you might want to delete the product key from the Registry to avoid someone extracting the key from the Registry with the help of software and then use it on his/her PC. Luckily, Windows allows you delete the product key from the Registry without deactivating your activation. And the good thing is that you don’t need to search for the key in the Registry. You just need to execute a command to clear the key from Registry. Follow the given below directions to quickly remove the product key from the Registry. Step 1: In your Start Menu Search box, type “cmd” (without quotes) and simultaneously press Ctrl + Shift + Enter keys to open the Command Prompt as Administrator. 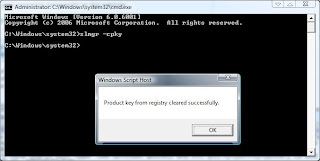 Step 2: In the elevated prompt, type the following command and press enter to delete the product key from registry. Wait for “Product key from Registry cleared successfully” confirmation message and then, restart your PC to take effect. That’s it! As said before, deleting the product key from Registry will have no effect on the current activation status of your Windows operating system. Strange! Sorry for the inconvenience. Are you using a genuine copy of Windows? If yes, please activate Windows again. build 7606 this copy of windows is not genuine..with black background… i’ve to activate windows today.. please give me a solution.. I think this method is valid for Windows 7 / Vista and the Server 2008 versions.. It may not work in legacy Windows systems.. It Is a non worker on the Sony Vaio VGN-A517s. Thank you very much! You really helped me out. Excellent tip! This should teach those nosy tech guys at the computershop when they “test” your defective hard drive before replacing it ;) THANKS!